Wallingford, CT 1894-1915 Succeeded by the Dowd-Rodgers Co.
C.B. Barker Mfg. Co. / C.E. Barker Mfg. Co.
New York, NY c. 1896-1915 See flatware patterns. half circle mark at the lower right was first used in 1921. East Syracuse, NY 1894-1902 See Benedict Manufacturing Co. Trademarks of F.B. 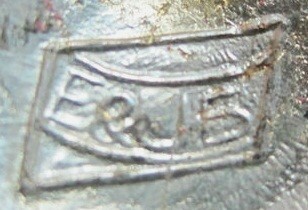 Rogers Silver Co.
who continued to use the S.E.B. mark. See flatware patterns. upon acquisition of the Ellis Silver Co. The mark to the right was used beginning in 1934. Charles Barbour. 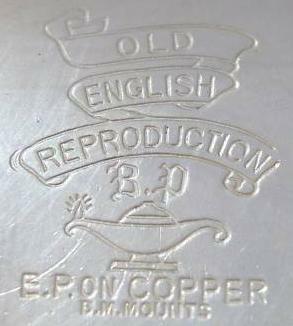 Succeeded by the Barbour Silver Co.
William Bancroft, James H. Redfield and James Rice. 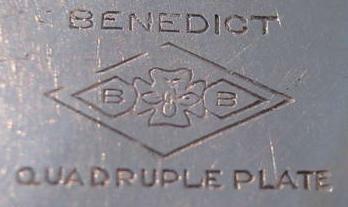 with this backstamp is believed to have been made by Williams Bros.
Business founded by Leopold Barth in 1868.
become the Albert Pick-L. Barth Co. 1926-1931. Makers of antique reproduction goods.